Some of the world’s great composers share the same leafy grove in Vienna’s central cemetery (the Zentralfriedhof), but there’s one notable omission: Mozart. So what do you do when there’s a hole (literally and figuratively) in your collection of honorary graves? You put up a memorial, instead. There’s a bit of mystery surrounding Mozart’s grave. But we do know two things: roughly where it is and that he’s no longer in it. Nobody knows where his bones ended up, but back in 1859 they at least erected a memorial at the best-guess location for his original burial site in St. Marx cemetery. A few years later, the city built a large, new cemetery (the Zentralfriedhof) some way from the centre and began adding famous graves to give it a bit of a popularity boost. They busily dug up many of Vienna’s favourite musical sons to create a cluster of composer graves that includes Beethoven, Brahms, Strauss, and Schubert. In 1891, one hundred years after his death, Mozart’s memorial was moved from St. Marx to join his musical contemporaries and successors at the Zentralfriedhof. It features a grieving muse, as well as Mozart’s portrait in relief. It’s not unusual to find flowers left there by well-wishers. 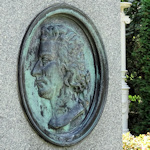 The memorial’s creator was Hanns Gasser, whose various sculptures can still be seen around the city today, some of which have their own link to the great composer. Gasser helped decorate, for example, the main altar at the Waisenhauskirche, the very church where a 12-year-old Mozart once conducted a performance of the Mass in C minor (the “Waisenhausmesse”) he wrote for the church’s consecration. Gasser also produced sculptures for fountains outside the State Opera House, which was completed in 1869 and has hosted over 1000 performances of The Marriage of Figaro, to name just one Mozart opera. For directions to the cemetery, see the main Zentralfriedhof article. Once inside the cemetery, follow the directions for Beethoven: Mozart’s memorial is just in front of Beethoven’s (no coincidence, I think).